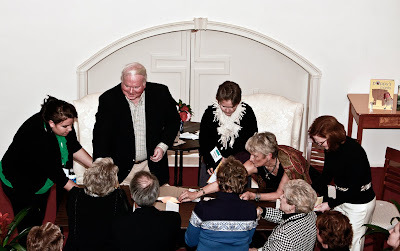 Pat Conroy and his daughter Melissa sign books at this historic First Baptist Church in downtown Fernandina Beach during the Amelia Island Book Festival weekend, Feb. 13. Highlighting the Amelia Island Book Festival's ninth year was bestsellling author Pat Conroy, his wife Cassandra King and Conroy's daughter, Melissa Conroy. The trio attracted scores of booklovers at a ticketed booksigning for Conroy's latest "South of Broad" and Melissa's Conroy's new children's book "Poppy's Pants." An invitation-only champagne reception followed the signing at an historic home in Fernandina Beach. Headlining the annual festival luncheon was Jeff Sharra, who narrated how he went from rare coins collector to historical fiction writer, following in the steps of his Pulitzer Prize winning father Michael Shaara, author of "The Killing Fields," of which the film "Gettysburg" was based. 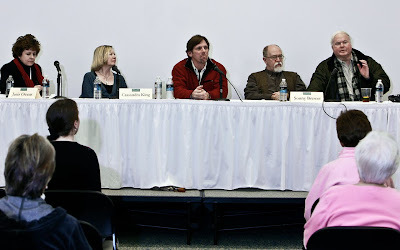 Authors Janis Owens, Cassandra King, Jack Riggs, Sonny Brewer and Pat Conroy discuss “Putting the South in Southern Writing” at a panel during the Amelia Island Book Festival Writers’ Workshop, Feb. 12. A Writers' Workshop featured keynote speaker Sonny Brewer, author of "The Poet of Tolstoy Park" and a crowd favorite. Brewer joined fellow authors Jack Riggs, Janis Owens, Cassandra King and surprise member Pat Conroy for a panel discussion on "Putting the South in Southern Writing." Festival Executive Director Dickie Anderson said the two-day multievent festival places "Our little Mayberry - Amelia Island - on the map." Anderson thanked the scores of volunteers and generous authors who gave of their time to make the Authors in Schools program and the various festival events such a huge success.